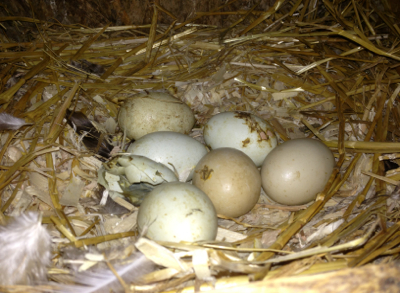 Back on July 19 (a full four weeks ago) I wrote that the Cuckoo Marans hen had taken to the nest. 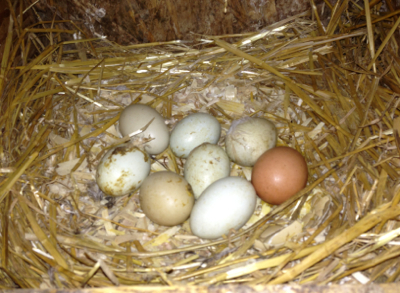 At one point she had ten eggs under her, but she's gradually eaten up the ones that weren't developing. This afternoon when she hopped out there were six, but I rolled them around and one was too light to have anything worthwhile in it. I threw it in the garbage can in the barn. Unfortunately I forgot that I'd emptied the can earlier thus week. When the egg hit the bottom it broke, emitting the gaggy smell of rotten egg. Eck! So now there are five. I long ago stopped marking them. I don't know if she's been on those specific eggs for weeks, or if they were freshly laid in the past few days. But I can tell you that I dreamed last night that she hatched five eggs! Foreshadowing? 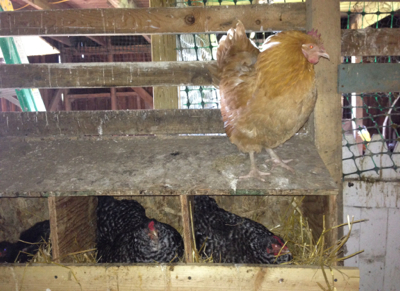 The striped hen on the right has been nesting for a couple of weeks now. Yesterday she happened to hop off while I was in the barn, so I got a peek at what she's sitting on.